As begun on Lonely Are The Brave, his latest Spirit Black finds the vocalist Jorn Lande exploring his heavier, more metal side. Previously there were still some hints of melodic, though heavier, hard rock. But mostly, it was melodic heavy metal album, and so you'll find the same on Spirit Black. If Dio were still doing the Dio of the 1990's, then they might sound exactly like this. The title track, Below, and The Last Revolution clearly go to the metal side of Spirit Black as they are distinctly deep and heavy. Towards the melodic hard rock side are such songs as Road Of The Cross, with it's rock groove, and the modern Whitesnake-like, Burn Your Flame (and short enough to be a single release, if called upon). Yet, as expected some tracks simply obscure the line like the interesting City In Between which tempts ballad classification, or the heavy, steady, and soaring I Walk Alone with its epic refrain. Only once did I think Jorn and company stumbled, and that was on the pitifully uninspired The Last Revolution. Jorn Lande's Spirit Black finds the vocalist blurring the lines between melodic heavy metal and hard rock once again, and being thoroughly convincing at doing so. It may be more of the same from Lande, but he's quite good at it. Recommended! 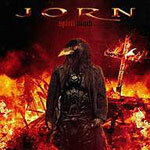 Jorn Lande's Spirit Black finds the vocalist blurring the lines between melodic heavy metal and hard rock once again, and being thoroughly convincing at doing so. It may be more of the same from Lande, but he's quite good at it.